One of today’s hottest trends in workforce health engagement is gamification. Gamification is the use of tactics inspired by games — especially video games — to engage people. Think about what makes video games so alluring and habit-forming for people … they’re fun, of course, but they also provide instant feedback, friendly competition, perhaps a social component, and more. There are several vendors offering gamification solutions for wellness, and one of the first was Keas. 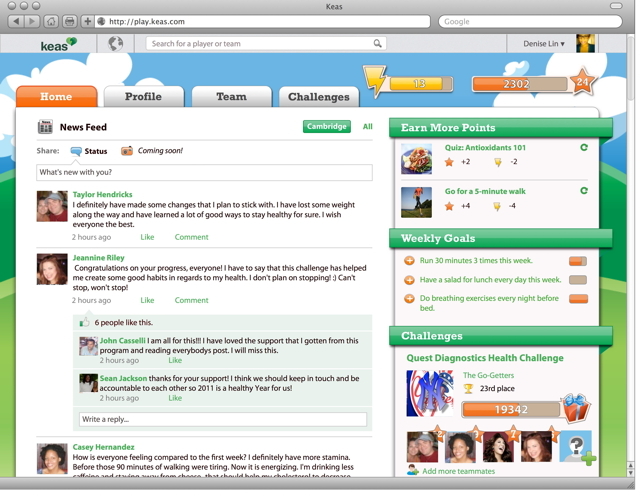 Keas is a company that Mashable said began as the Mint.com for health and became the Farmville for corporate wellness. Back in 2010, Keas realized it was failing to make an impact, and so it revamped its entire program with a gamification approach. Today we’ll find out what kind of difference that made, and how the program works. Our guest, Josh Stevens, has been in the tech world for many years, at companies like AOL, TicketsNow.com, and YouSendIt. Today he is the CEO of Keas. This interview with Josh Stevens originally aired in June 2013 on our Game Changer podcast, which is a series focused using gamification to engage employees.